AEA hired Baird as a bookrunner on the IPO of its portfolio company GMS, the leading North American distributor of wallboard and suspended ceilings systems. 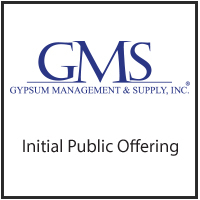 GMS has a unique business model, representing a convergence of two different sectors as an Industrial Distributor with Building Products end-markets. AEA recognized the strength of Baird’s Equity Capital Markets platform and its exceptional track record in the Industrial Distribution space. Baird’s unmatched Distribution track record, combined with the expertise of its leading Building Products franchise, differentiated Baird in its ability to tell the GMS story and position the Company with the appropriate investor universe. Through a collaborative, teamwork approach between its Industrial Distribution and Building Products practices, Baird was able to effectively position the company with investors and generate strong demand for a successful initial public offering.